Day 19 of my Blog Challenge has been extremely busy. Over the past few weeks I have been packing up my home in anticipation of our impending move. During my planning of packing up.. I have made a huge list of what needs to be done. I have started in the office. I have sorted and packed up everything in that room. Those who know me, will be shocked as it was the dumping room of the house. If something didn’t have a home. It got put there. It was also home to my manicure station. I had lights set up for a make shift photography studio. I take photos of things for my website and things to be sold online. It also houses my filing cabinet. I am amazed at how ruthless I have become. I have adopted the theory by Marie Kondo, a Japanese organising consultant. She wrote a book called “The Life-changing Magic of Tidying up – The Japanese Art of Decluttering an Organizing”. The idea is you hold an item you own and if it sparks joy in you.. you keep it, if it doesnt, you get rid of it! So the huge pile of things I am not keeping, have been put into more piles, bin, donation and “To sell” piles. The sell pile is on my list to be put on Gumtree. I have put some donation things on a giveaway page on Facebook. So today I looked outside and decided that our outdoor furniture was looking extremely drab and unloved. The maintenance I usually do yearly, is two years behind. This is due to my being ill in 2016 and letting it fall to the wayside. 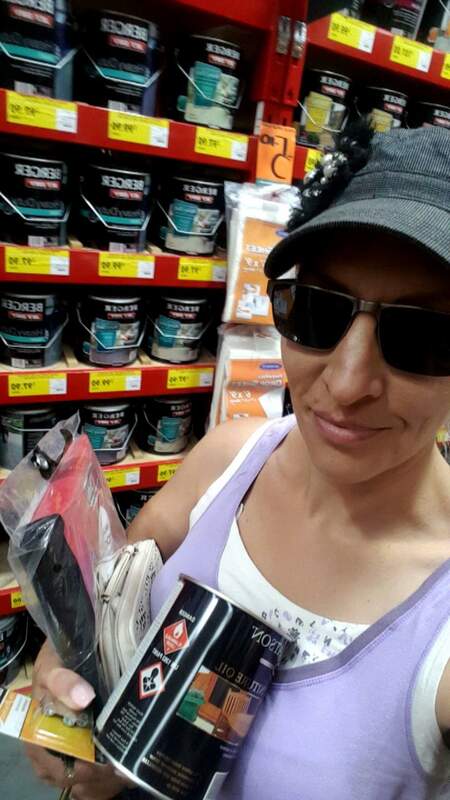 I took a quick trip to Bunnings to stock up on sandpaper pads for the electric sander, some replacement threads that were discovered missing upon tightening them earlier and outdoor furniture wood cleaner and oil. 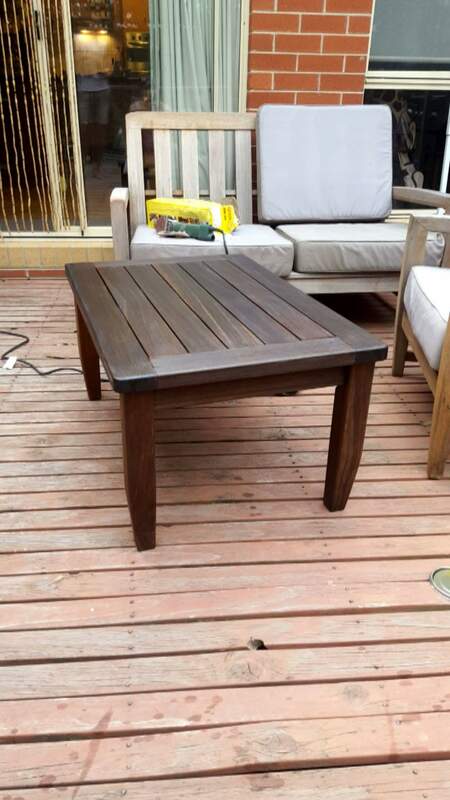 I managed to get the outdoor coffee table cleaned, sanded and oiled. It took me a few hours. There are nine pieces of the outdoor setting left to go. But I am determined to get it completed to be ready to move to our new home. You can see the state of the other pieces in the background. The table has come up looking fantastic.. almost like brand new. Do I have any volunteers to help with the table and chairs, lounge and bench seat? ?